This free printable newspaper scavenger hunt is a great way to entertain the kids during your morning breakfast. It’s also a great opportunity for teaching them how to navigate through a newspaper. When is the last time you read a paper copy of a newspaper? Do you usually read your news online or watch it on TV? If you don’t get the paper delivered to home, you’ll have to make a trip to your local store to pick up a paper copy for this game. Depending on the ages of your little ones, you may have to help a bit for the searching. Since each newspaper is different, this is a fun game you can enjoy more than once. 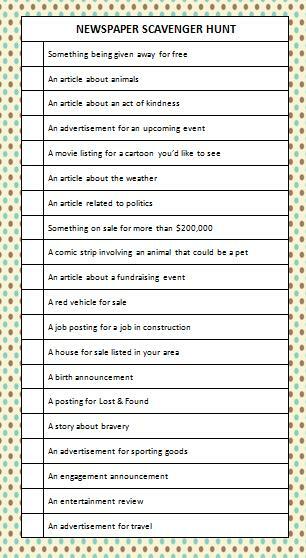 Print out a couple of copies of this newspaper scavenger hunt or “pin” it on Pinterest to come back to later. What are your favorite sections of the newspaper to look through? I always peek at the announcements section in the weekend paper to see if I recognize any newly engaged or married couples. Looking for more fun & free printable scavenger hunts? Click here for the Moms & Munchkins free printable games page. We have plenty of other ideas for scavenger hunts, charades, word searches and other fun games. We’re always adding new ideas so follow along on Facebook, Twitter, Pinterest or our new RSS feed Bloglovin’. This is such a great idea! I can’t believe I had never seen this before. Thanks for sharing. I thought the Newspaper Scavenger Hunt worksheet was great. I made a copy and saved a copy to be able to change things. I also shared with one of the English teachers who uses the newspaper on a daily basis. She has a variety of lessons she has the students work on.